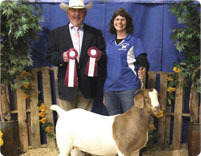 We began our venture into boer goats in 2007. 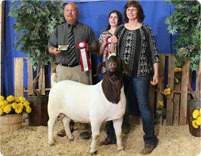 What started out as a simple few 4-H pojects of or children has evolved into the operation we manage today. 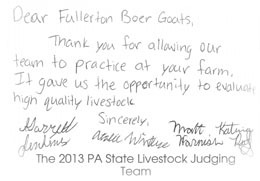 Our focus has been and continues to be, building the better boer goat. We are utilizing the best genetics we can aquire and breeding with live coverage, artifcial insemination and flushing quality does. 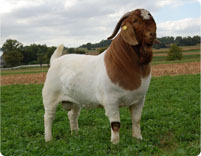 Please check out our brood does, bucks and show photos for a small sample of our boer goats. 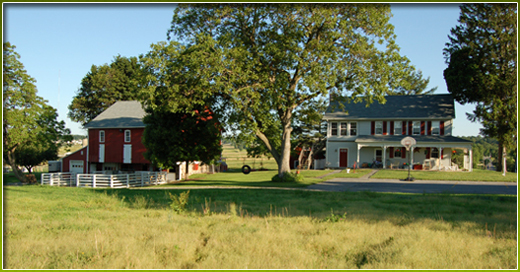 We currently are managing a herd of over 100 animals which includes bucks, does, kids and recipient does. 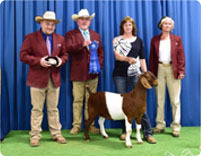 LGF3 Start Me Up wins the overall grand champion buck at the BGANC show in North Carolina under judge Dave Carter. VBR The Virginian comes to us from Virginia Boer Ranch, many thanks to the Wingfield Family for allowing us this opportunity to own a powerful buck such as this. The Virginian has numerous overall champion wins to his credit. This buck has a tremendously powerful front that carries through his loin and all the way to his rear quarter.